Edit: it seems that FFmpeg is not able to parse the parameters given after the rtmp:// URL. The calling app need to parse them and pass them to the demuxer as options (see rtmpproto.c). Last edited by clsid; 22nd June 2013 at 17:03. I accidentally pushed a test branch, it was up for maybe 5 minutes or so, and if you had read the commit message that came with it, it would've explained that anyone testing this is on their own. Has anyone else experienced random glitches with what I assume is avcodec decoding? Sometimes I'll have a small square patch that displays properly while the rest of the video freezes. It happens on both my PCs, if you rewind and replay that particular sequence there is no problems, completely random. nevcairiel, does lav correctly set the average time per frame on dynamic format change ? You should never really rely on that value, its notoriously inaccurate. But sure, when the source sends a new time, it should end up at LAVs output as well. Unless of course its one of those cases where LAV decides to override it with a bitstream value. Last edited by nevcairiel; 23rd June 2013 at 14:30. It seems not to propagate the value, and if it has overridden it, then it's done so incorrectly I think. Like i said, simply don't rely on it, its unreliable. This message has been reduced in length due to heat. Standard disclaimer applies, report regressions/issues, include samples, because without reproducing a bug, no fixing a bug. So, take care, and enjoy the summer while it lasts - well, if the summer reached you yet. Last edited by nevcairiel; 23rd June 2013 at 15:16. And yes, its hot on Baltic sea these days. Heh, I'm wearing a jumper indoors! Thanks for the new release. Would you care to expand a bit on the "Improved detection of progressive streams to ensure deinterlacing is disabled, especially when "Aggressive Deinterlacing" is used" fix? 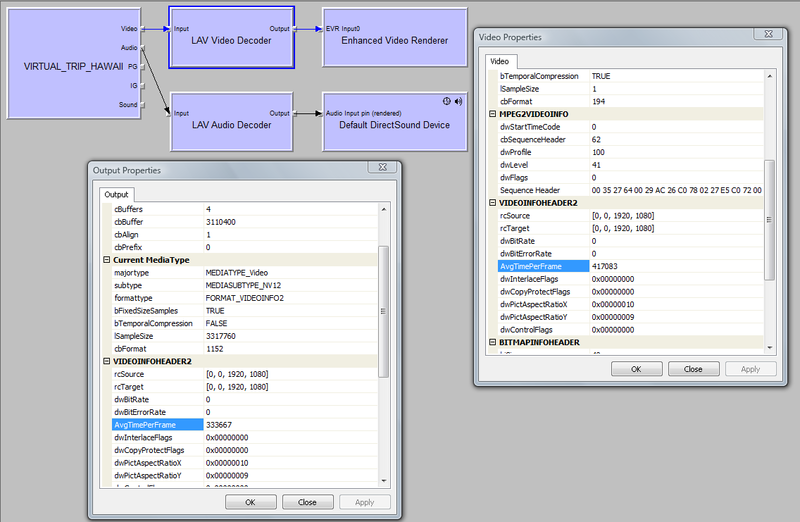 It does what it says, it improves the detection of 100% progressive streams to ensure deinterlacing is turned off. I see. I assume it's not based on looking at the actual frame images though? No. Just the info in the bitstream. There seems to be a LAV Splitter regression regarding MKV Segment Linking which was introduced between LAVFilters-0.55.3-73-g3f9ce87 and LAVFilters-0.56.1. I'll PM you a sample. Its not a regression if it never worked in a release. v0.58 doesnt solve my issue. I have updated Issue 353 on bugtracker. Ill think now you should be able to easily reproduce the problem.